Citation Information: J Clin Invest. 2014;124(2):466-472. https://doi.org/10.1172/JCI70050. During bone resorption, abundant factors previously buried in the bone matrix are released into the bone marrow microenvironment, which results in recruitment and differentiation of bone marrow mesenchymal stem cells (MSCs) for subsequent bone formation, temporally and spatially coupling bone remodeling. Parathyroid hormone (PTH) orchestrates the signaling of many pathways that direct MSC fate. The spatiotemporal release and activation of matrix TGF-β during osteoclast bone resorption recruits MSCs to bone-resorptive sites. Dysregulation of TGF-β alters MSC fate, uncoupling bone remodeling and causing skeletal disorders. Modulation of TGF-β or PTH signaling may reestablish coupled bone remodeling and be a potential therapy. Modulation of the bone marrow microenvironment by PTH-stimulated bone remodeling. PTH enhances osteoclast bone resorption through direct activation of cells in the osteoblastic cell lineage. During bone remodeling, active TGF-β, IGF-1, and many other bone matrix factors are released to the marrow. PTH orchestrates signaling of local factors, including (but not limited to) TGF-β, Wnts, and BMP. Thus, PTH regulates cellular activities — including those of MSCs, T cells, and other PTH-responsive cells — in the bone marrow to integrate systemic control of bone remodeling. 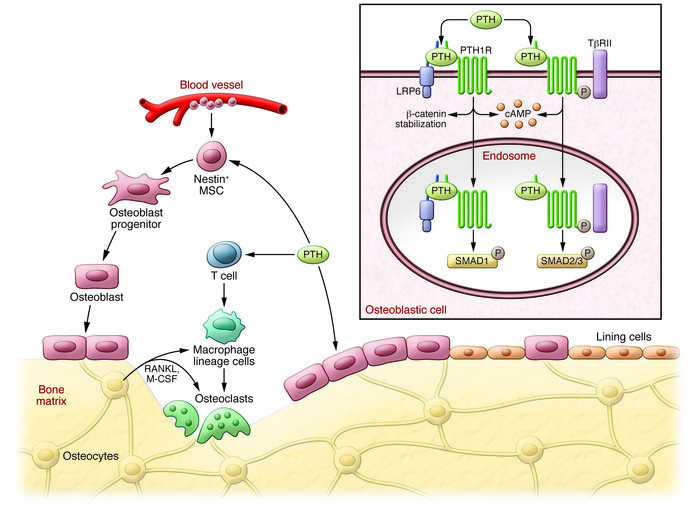 PTH-stimulated bone remodeling expands nestin+ MSC populations, spatially relocates blood vessels closer to sites of new bone formation, and orchestrates the osteogenic bone marrow microenvironment.